The MABRA and VACX series collided in Charlottesville this past Sunday. We’ve surveyed several podium finishers to give you a view from the front. Some quick takeaways from our interviews: (1) The venue and the promoters rocked, (2) sand pits are good, (3) brick walls are bad, and (4) animal sacrifice may be the answer. CJ Congrove shot some incredible video of the race. It is available here and here. Want to see photos? Go here (Bill Schieken) and here (Ryan Dudek). Even more photos here (Ruth Stornetta) and here (Mike Powers). We hope you enjoy our interviews. Please feel free to leave a comment and let us know what you think. If you have a question you would like to see us ask for next time, or any other suggestions, send them to cyclocrossnews@gmail.com. 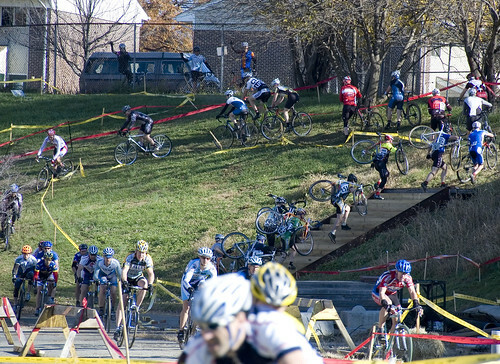 Previous Previous post: Urban Cross 2008: Come Here Often? Next Next post: Growing Pains.